June 8, 2012, was one to remember for the Northwest Arkansas Naturals. They received media attention that rivaled, or even surpassed, that of any Opening Day, and the team store enjoyed its highest revenue night ever. So what confluence of events led to such a successful evening at Arvest Ballpark? A rehab appearance by a Major League superstar? A highly coveted bobblehead giveaway? A postgame performance by the (as of now) theoretical Minor League touring performer dream team of Mr. Belding, Jerry "The King" Lawler and Cowboy Monkey Rodeo? Uh, no. What happened was that, for one night only, the Naturals changed their name to the "Thunder Chickens." Players took the field in snazzy black Thunder Chickens jerseys, and the intimidation factor was only increased by the "NWA" on the front of their caps (with the "W" in the shape of a splayed chicken foot). The jerseys were auctioned right off of the player's backs after the game -- perhaps they were anxious to get rid of them? 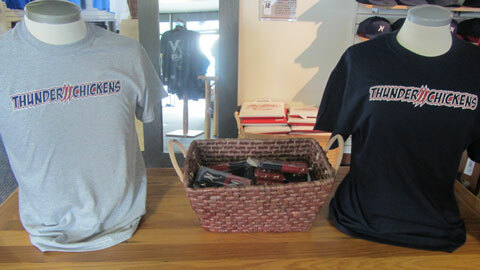 -- and a limited edition run of "Thunder Chickens" hats and t-shirts were available in the team store. This one-night-only foray into the land of the Thunder Chickens was the latest in a promotional phenomenon that has swept through the Minor League landscape in recent years: "What Could've Been" nights. The concept is simple enough and lends itself to all manner of alternate reality theorizing and philosophizing: teams simply imagine "What could've been" if they had been named something else. The Bowling Green Hot Rods originated the concept in 2009, when they took the field as the "Cave Shrimp" (one of the runners-up in their "Name the Team" contest). It was a well received event -- one that went on to win MiLB.com's "Promotion of the Year" -- and, thus, a trend was born. Like "Cave Shrimp" in Bowling Green," Thunder Chickens" was a runner-up in Northwest Arkansas' 2007 "Name the Team" contest. And if you're moved to ask "Why Thunder Chickens?" perhaps a better question would be "Why not Thunder Chickens?" The name was first suggested on a popular Arkansas Razorbacks message board, whose users soon mounted a vociferous campaign in support of this earth-shaking fowl. "I think the feeling [on the message board] was that 'We'll vote for Thunder Chickens, and if it actually wins we'll be able to laugh at them,'" explained Naturals general manager Eric Edelstein, who has held his job since the inception of the franchise. "But there were other people who supported it, because that kind of name, that's what Minor League Baseball is all about. "It's fun to think back about how [Thunder Chickens] would have been received," he continued. "From a personality standpoint, would I be a goofier guy? Would we be predisposed to be a goofier operation?" Edelstein ruminated on these deep questions before Saturday's ballgame, one night after the "Thunder Chickens" extravaganza. As he spoke, the scene around him at Arvest Ballpark was, more or less, back to normal. A few stray yellow feathers were still gathered beneath a nearby stairwell, likely the remnants of a costume worn by Strike the mascot ("He looked like Liberace as a chicken," said Edelstein). And a few of the fans who had attended the night before were proudly wearing the "Thunder Chickens" gear that had been put on sale in the team store, the only place on Earth in which such merchandise was available. "We had people calling us, emailing, asking on Twitter 'How can I get a Thunder Chickens hat?'" said Edelstein. "Our response was 'Sorry, you're going to have to find a way to be here. How bad do you want it?'" The "Thunder Chickens" name has its charms, but most would agree that "Naturals" was a more, well, natural name for this Springdale, Ark.-based team. Arkansas is known as "The Natural State," after all, and as Edelstein points out "the name has a great baseball feel to it because of the movie." That movie would be The Natural, which, as an added bonus, was filmed in the same city (Buffalo, N.Y.) that the Naturals' ownership group is based out of. So Naturals it is, was, and will be -- save for Friday night's one-time-only promotional exercise, in which the Thunder Chickens defeated the Arkansas Travelers by a score of 5-4. "After the game, I put out a tweet: 'The Thunder Chickens will never be defeated!,'" said Edelstein. "And immediately I started to hear from fans, 'Wait, you're not going to do it again?' And that got me to thinking." "Well, I guess there's a reality in which we can do it again."